This section is used to change a physical network NIC configuration. The global settings to change a certain network NIC configuration are the following. Name. System name for the physical interface. Not editable. MAC. 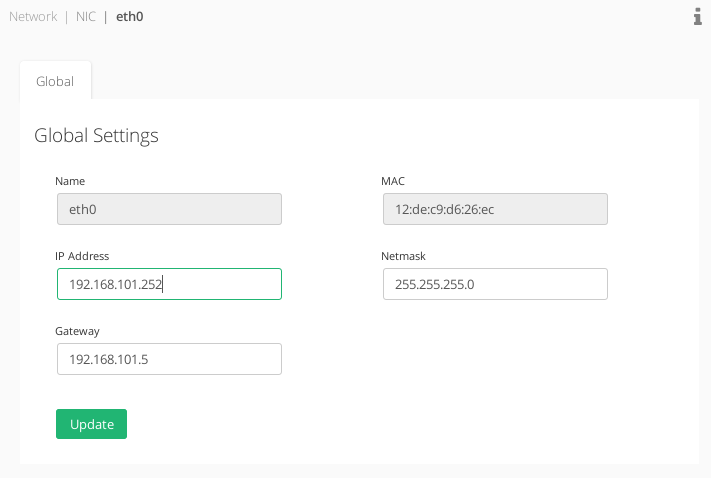 MAC address that is assigned to a certain NIC. Not editable. IP Address. IP address in IPv4 format currently assigned to the interface that can be edited. Netmask. Network mask in IPv4 format currently assigned to the NIC that can be edited. Gateway. Default gateway in IPv4 format currently used by the NIC that can be edited. Once all the required changes are done, press the Update button to apply the new changes.